In a typical work week, employees spend an average of 5 hours and 41 minutes per day sitting at their desks, according to the British Psychological Society. That’s a long time to sit in a chair that may not fit your anthropometrics (individual measurements). To get the right one, you may need to test the fit at a local store. Just like with clothes or shoes, there is no such thing as “one size fits all.” Since most companies can’t dedicate the resources for everyone to find their dream chair, here are a few tips for making the best decision for the largest group of people. When aiming for “one size fits most,” the most important feature is adjustability of the back height and angle, height and width of the arm supports, seat tilt, and the seat depth. The correct seat angle can help employees avoid sustained pressure on the backs of the thighs, which can restrict blood flow to the lower legs and feet. And especially in the case of taller employees or those with longer legs, adjusting the seat depth can mean the difference between full support or feeling like they will slide right off the seat pan. There is a reason your grandma told you to “sit up straight!” When you slump or slouch, your spine shifts out of its neutral S-curve posture and the compression forces on it increase. A seat back that extends to between the shoulder blades helps guide the back into a neutral posture and even supports some internal weight that the abdominal muscles would otherwise have to support. Some manufacturers even offer chairs with adjustable sacral support to further promote the ideal S-shape! If your office is located in a warmer climate, consider a chair with mesh fabric on the back support for better air circulation, comfort, and durability. Any moisture that might affect the look, feel, and even scent of a leather or fabric chair quickly evaporates from the mesh material, reducing the likelihood of skin irritation and germ growth. In a time when so many of us have a habit of online or one-stop shopping, we may forget about the benefits of working with a store that specializes in what we want. Check out local furniture suppliers to personally experience the comfort level and adjustability of a chair. Also, if you’re looking to replace multiple chairs at once, most stores offer bulk discounts for large shipments that could save you thousands. 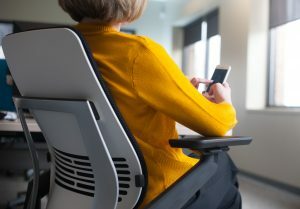 Taking the time to select the best chair for your employees goes a long way in improving their comfort and well-being.